We might already know who we’re gonna be calling in the new Ghostbusters. Zoe Saldana and Karen Gillen say goodbye to their time on Avengers: Endgame. Star Trek: Discovery’s executive producer promises a lighter, more celebratory second season. The new Creepshow could be adapting a Stephen King story. Plus tons of posters for Alita: Battle Angel, Hellboy, and John Wick: Chapter 3. Hi-o Spoilers, away! 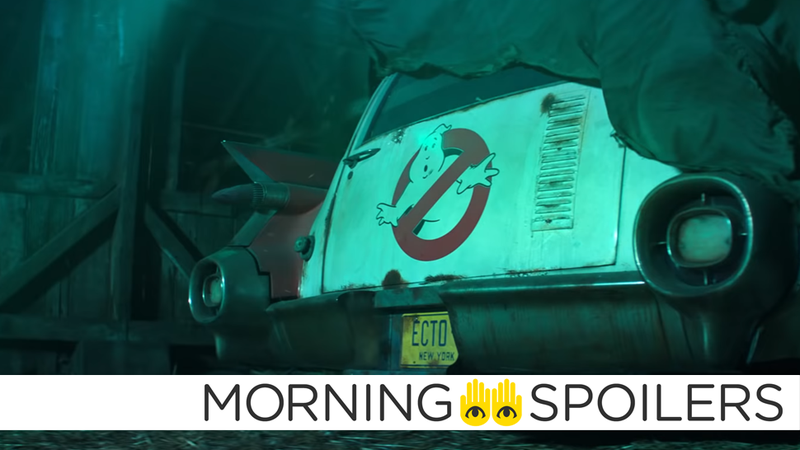 We might have only just got official word that Jason Reitman’s Ghostbusters film is, after years of talk, actually happening, but THR’s Borys Kit reports the new Ghostbusters will star the next generation of paranormal investigators: four teens, two boys and two girls. Both Zoe Saldana and Karen Gillen revealed they’ve recently wrapped reshoots on Avengers: Endgame. THR reports AGC Studios has greenlit a new sci-fi thriller from Howard Berger (Divergent, Limitless) concerning a spaceship full of children descending into chaos after its captain is murdered. Speaking with Screen Rant, Rhett Reese confirmed the Zombieland sequel is not titled Zombieland, Too. Yeah, that’s not the title. I don’t know why that’s on IMDB. Sometimes we just scratch our heads over how things like that happen. Coming Soon has two new Hellboy posters. Things look bad for John Wick on a stylish new poster from Bloody-Disgusting. Did you catch that excellent first trailer yesterday? Coming Soon also has a full gallery of character posters for Alita: Battle Angel. Head over there to see the rest. Sometimes, dead is better in the first TV spot for the Pet Sematary remake. After being shrunk to the size of an insect, a young boy must sail his toy boat across the length of his parent’s flooded cafe in the first trailer for Captain Morten and The Spider Queen, a new stop-motion film starring the voices of Michael McElhatton, Ciarán Hinds, Brendan Gleeson, and Susie Power. According to Revenge of the Fans, Power Rangers actor RJ Cyler has joined the cast of Swamp Thing in a currently undisclosed role. Amanda Collin, Abubakar Salim, Winta McGrath, Niamh Algar, Felix Jamieson, Ethan Hazzard, Jordan Loughran, Aasiya Shah, and Ivy Wong have all joined the cast of Ridley Scott’s new sci-fi series, Raised by Wolves. According to Deadline, Collin will play Mother, “an android with a secret past who has been programmed to raise a brood of human children on a faraway planet” while Salim plays Father, “an android whose devotion to his human children is matched only by his devotion to Mother.” McGrath has been cast as Campion, “a scrappy and soulful 12-year-old boy who was raised by Mother and Father since birth” while Algar joins as Sue, “a strong, resourceful combat medic who put aside her reservations about coming to this new planet at the urging of her husband Marcus.” Jamieson will play Paul, “Sue and Marcus’ 12-year-old son, a boy of unshakable faith in both his religion and his father.” Additionally, Hazzard, Loughran, Shah and Wong will all play children under the care of Mother and Father. According to executive producer Heather Kadin, season two of Star Trek: Discovery is “lighter and brighter” than the first. There was a lot of heaviness. [Season 2] is a little lighter and brighter. In any historical time, after war is much more celebratory and lighter and fun. Production Weekly reports the upcoming Creepshow TV series will adapt Stephen King’s story, Survivor Type, concerning a shipwrecked surgeon going to hideous lengths in order to survive. Barry (Grant Gustin) and Ralph (Hartley Sawyer) must go undercover as criminals in an illegal black market to purchase a device that could help them stop Cicada (Chris Klein). Once inside, Barry and Ralph find their morality tested as they slip deeper into the criminal world, eventually having to choose between committing a crime, or losing the means to defeat one of their greatest foes. Meanwhile, Iris (Candice Patton) investigates a lead on Cicada’s whereabouts and ends up in a dangerous situation. Alexandra LaRoche directed the episode written by Jonathan Butler & Gabriel Garza (#513). Original airdate 2/5/2019. Jeanine Mason and Heather Hemmens discuss their characters in two new interviews with the CW. Finally, Lana Condor extolls life advice as both herself and character Saya Kuroki in a new featurette from Syfy.